When in first joined the gym, I was instructed by my personal trainer to cut down on my meal portion intake. But I asked him, how about snacks? I can sometimes get really hungry at work. He said to munch on nuts. And so I got myself some roasted almonds, my favourite. But one day, I saw and bought a bag of roasted almonds with dried cranberries. 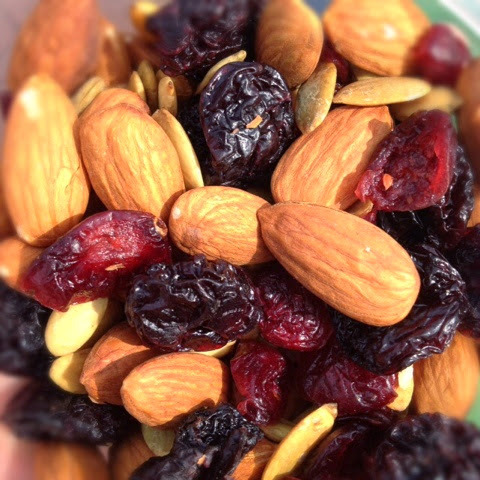 It was a delightful combination - crunchy aromatic almonds with sweet tangy cranberries. But soon I was mixing it myself, since I can't find it in the other supermarkets I went. Much cheaper and just as yummy!